This program ended on 10/19/2013 (SAT) 28:53 . This program ended on 10/19/2013 (SAT) 28:53. This is a paid broadcast. the ability to alter the storyline for a theatrical play! must find a way to allude capture. 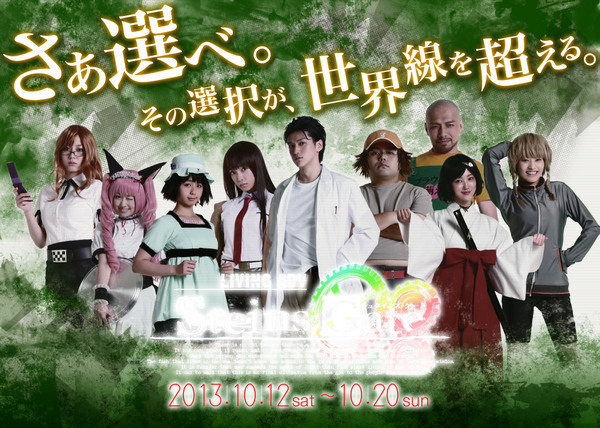 Daisuke Watanabe as "Rintaro Okabe"
Erika Tonooka as "Kurisu Makise"
Rine Koike as "Mayuri Shiina"
Mitsuhiro Nagatomo as "Itaru Hashida"
Tsukui Minami as "Suzuha Amane"
Rie Ueda as "Ruka Urushibara"
Yumi Sugimoto as "Moeka Kiryu"
Manami Ikura as "Faris Nyannyan"
Teruaki Ogawa as "Yugo Tennoji"
*You must have a Net Ticket to view this broadcast. Note that Net Tickets are nonrefundable.